Interested in joining the MIT Physics Community? Are you an MIT student who would like to receive the latest news and upcoming events listings from the Physics Department? its core content online, maximizing time for in-class interactivity. An undergraduate degree in physics provides an excellent basis not only for graduate study in physics and related fields, but also for professional work in such fields as astrophysics, biophysics, engineering and applied physics, geophysics, management, law, or medicine. The undergraduate curriculum offers students the opportunity to acquire a deep conceptual understanding of fundamental physics. The core departmental requirements begin this process. The student then chooses one of two options to complete the degree. The focused option is designed for students who plan to pursue physics as a career. The flexible option is designed for those who are interested in other, perhaps nontraditional, career paths. Either option provides a considerable amount of time for exploration through electives. Students proceed at the pace and degree of specialization best suited to their individual capacities. Both options lead to the same degree: the Bachelor of Science in Physics. This option—which includes three terms of quantum mechanics, 36 units of laboratory experience, and a thesis—is ideal preparation for a career in physics. In the second year, students take 8.03 Physics III, 8.033 Relativity, 8.04 Quantum Physics I, and 8.044 Statistical Physics I, and 8.223 Classical Mechanics II. 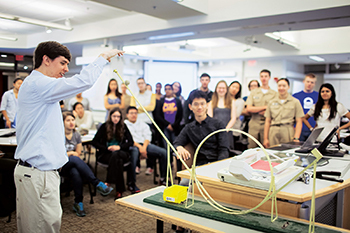 Important skills for experimentation in physics may be acquired by starting an Undergraduate Research Opportunities Program (UROP) project. In the third year, students normally take laboratory subjects 8.13 and 8.14 Experimental Physics I and II, along with 8.05 and 8.06 Quantum Physics II and III. Students should also begin to take the restricted elective subjects, one in mathematics and at least two in physics. The mathematics subjects 18.04 Complex Variables with Applications, 18.075 Advanced Calculus for Engineers, and 18.06 Linear Algebra are particularly popular with physics majors. Topical elective subjects in astrophysics, biological physics, condensed matter, plasma, and nuclear and particle physics, allow students to gain an appreciation of the forefronts of modern physics. Students intending to go on to graduate school in physics are encouraged to take the theoretical physics sequence 8.07 Electromagnetism II, 8.08 Statistical Physics II, and 8.09 Classical Mechanics II. An important component of this option is the thesis, which is a physics research project carried out under the guidance of a faculty member. Many thesis projects grow naturally out of UROP projects. Students should have some idea of a thesis topic by the middle of their junior year. A thesis proposal must be submitted before registering for thesis units and no later than Add Date of the fall term of the senior year. A relatively large amount of elective time usually becomes available during the fourth year and can be used either to deepen one's background in physics or to explore other disciplines. This option is designed for students who wish to develop a strong background in the fundamentals of physics and then build on this foundation as they prepare for career paths that may not involve a graduate degree in physics. In the past, many students have found an understanding of the basic concepts of physics and an appreciation of the physicist's approach to problem solving an excellent preparation for careers in business, law, medicine, or engineering. This option should be even more attractive today in light of the growing spectrum of nontraditional, technology-related career opportunities. The option begins with the core subjects 8.01, 8.02, 8.03, 8.044, 8.04, and either 8.21 or 8.223. Students round out their foundation material with either an additional quantum mechanics subject (8.05) or a subject in relativity (8.20 or 8.033). There is an experimental requirement of 8.13 or, with the approval of the department, a laboratory subject of similar intensity in another department, an experimental research project or senior thesis, or an experimentally oriented summer externship. An exploration requirement consists of one elective subject in physics. Students following this option must complete a focus requirement—three subjects forming one intellectually coherent unit in some area (not necessarily physics), subject to the approval of the department and separate from those used by the student to satisfy the HASS requirement. Areas of focus chosen by students in the past include astronomy, biology, computational physics, nanotechnology, history of science, science and technology policy, philosophy, and science teaching. Some students may choose to satisfy their experimental and exploration requirements in the same area as their focus; others may opt for greater breadth by choosing other fields to fulfill these requirements. Students can satisfy the departmental portion of the Communication Requirement by taking two of the following of subjects: 8.06, 8.13, 8.225, 8.226, or 8.287J. The department and the Subcommittee on the Communication Requirement may accept substitution of one of the department's two required CI-M subjects with a CI-M subject in another department if it forms a natural part of the student's physics program. Although students may choose this option at any time in their undergraduate career, many make this choice during their sophomore year in order to have enough time to craft a program that best suits their individual needs. Specific subject choices for the experimental and focus requirements require the written approval of the Associate Department Head. For detailed descriptions on the two undergraduate options, consult the MIT Bulletin, or the Department of Physics Undergraduate Degree Requirements (PDF version).